Stunning, contemporary 5 Bedroom Executive Home with Woodland Views. Enjoy a relaxing and luxurious vacation in this beautifully furnished contemporary home which has had a top to bottom makeover including wooden floors, stainless steel appliances and granite counter tops. Located in the prestigious Highlands Reserve Golf Resort, just a few minutes walk from the clubhouse, the home is also within easy reach of Disney World (10 mins) making it ideal for golf groups and family vacations alike. Master Suite - King size bed, en-suite bathroom, TV, cable, closet, safe. Queen Suite - Queen bed, TV, cable,closet. Queen Bed -Queen bed, TV, cable,closet. Twin 1 - 2 single Beds, TV, cable,closet. Twin 2 - 2 single beds, TV, cable,X Box One, closet. The Master bathroom has his/hers sinks, large walk in shower, separate WC. Queen bathroom has his/hers sinks, combined bath/shower, separate WC. The family bathroom is on the first floor and comprises of bath, shower, WC and vanity unit. Beautiful brand new kitchen, with stunning granite worktops. Has nook, hob/stove, double fridge freezer, microwave, double sinks with waste disposal. Cutlery, china, glassware, and plastic plates/cups available for pool and BBQ times. Brand new washing machine, tumble dryer, iron and board, laundry basket, vacuum, brush and pan, mop etc. Beautiful open plan family room which provides a spacious feeling. 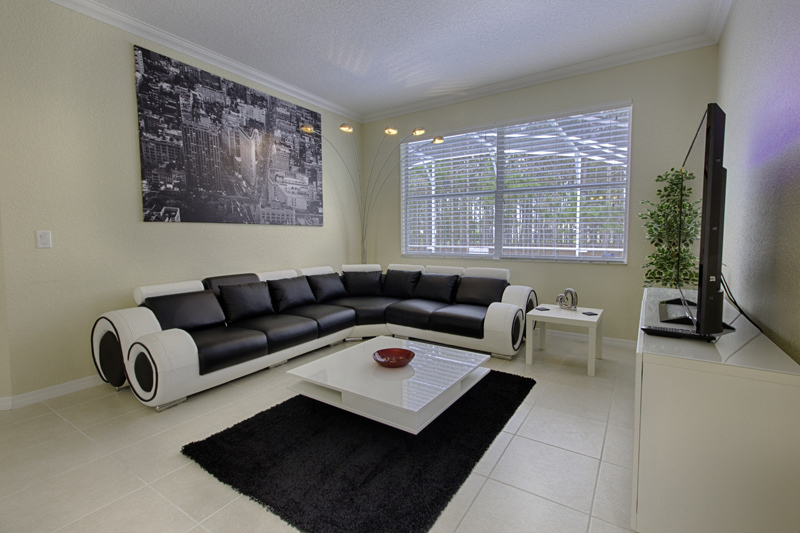 The room has a futuristic curved black/white leather recliner sofa perfect for relaxing after a busy day at the parks or on the golf course, 60in cable TV and DVD player. Kitchen area has seating for 4 with 3 more at breakfast bar. Dining room has formal seating for 6. Villa has games room which includes pool table, foosball table, air hockey, darts. TVs with cable in all rooms. All towels and linen are provided. Cot linen also provided. The property is cleaned for your arrival and again on your departure. Additional cleaning can be arranged during stay for an additional fee (if required). Barbecue, Pool Heating, Private Pool, Parking. Air Conditioning, Cable, Central Heating, Cot, High Chair, Internet Access, Telephone, TV. The villa is split over two levels. The downstairs accommodation (kitchen, dining room, family room and Queen Suite) is readily accessible to wheelchairs. The villa has a private pool and substantial deck area. Privacy around the pool is provided by beautiful woodland overview. Sun loungers are provided. Table and chairs are provided for al-fresco dining. Villa has BBQ available for guests to utilise. Pool heating can be provided during the cooler months for an additional fee. There is a baby high chair, cot/play pen and buggy available for guest use free of charge. The Master Suite has a safe for guest use. This house is awesome, I love the pool and the couches. Thanks for a wonderful house. Cabera 2016 New Years. Lovely Villa, had a fab time. Would come back real soon. Hanlon family. After 30 hours traveling from Spain, we turn up to an amazing luxurious villa which we wanted to stay in all day! The owners are amazing people, any issues we had they kindly fixed. Also gave us loads of tips where to go. Really sad we have to leave, but will be back soon. Recommended to all our friends. Fantastic memories! 18th April 2016. Thank you for giving us a safe haven during Hurricane Mathew!! So sweet and accommodating. Jones family Oct 16.